Europe's Mars Express is gathering data regarding the geologicaland atmospheric processes on the red planet -- information that might shore upthe case that present-day life is percolating subsurface. Recent analyses of datagleaned by the Planetary Fourier Spectrometer (PFS) carried by the spacecraft revealthat concentrations of water vapor and methane in the atmosphere of Marssignificantly overlap. Newin-depth looks at the PFS data also bears out that methane is not uniform inthe atmosphere, but thick in some areas. The PFS team observed that theareas of highest concentration of methane overlap with the areas where watervapor and underground water ice are also concentrated. Thisspatial correlation between water vapor and methane seems to point to a commonunderground source. Oneexciting prospect bolstered by the data: Can forms of bacterial life exist inthe water below the ice table, producing methane and other gases and releasingthem to the surface and then to the atmosphere? Indeed, the PFS data could behinting at the presence of extant life on Mars in terms of the presence of'biomarker' gases. TheMars Express data and what they could mean were reported today by VittorioFormisano, PFS principal investigator, at the International Mars Conferencebeing held this week in Ischia, Italy, andorganized by the Italian Space Agency. ThePFS is an Italian Space Agency instrument, developed by the Istituto di Fisicadello Spazio Interplanetario (IFSI) of the IstitutoNazionale di Astrofisica (INAF). ESAreleased today an overview of the PFS data, noting that at 6-9 miles (10-15kilometers) above the surface, water vapor is well mixed and uniform in theatmosphere. However, the instrument found that, close to the surface, watervapor is more concentrated in three broad equatorial regions: Arabia Terra,Elysium Planum and Arcadia-Memnonia. Inthose locales on Mars, the concentration is two to three times higher than inother regions observed. 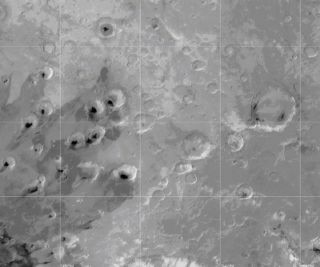 These particular areas of water vapor concentrationalso match up with places that NASA's Mars Odyssey spacecraft found a water icelayer just below the Martian surface, Formisano reported. TheESA press statement also explained that an underground ice layer - dubbed an"ice table" - could be the product of geothermal heat from below the surfacethat pushes water and other material towards the surface. It would then freezebefore getting there, due to the very low surface temperature on Mars. Can the geothermal processes which 'feed'the ice table also push water vapor and other gases, like methane, to thesurface? Can there be liquid water below the icetable? Can forms of bacterial life exist inthe water below the ice table, producing methane and other gases and releasingthem to the surface and then to the atmosphere? "Thisis great news," said James Garvin, Chief Scientist for Mars and the Moon and DeputyExploration Chief Scientist within the Science Mission Directorate at NASAHeadquarters, Washington, D.C.
"Allof us are encouraged by this first 'retrieval' from Mars orbit of suchnoteworthy species [gases], clearly relevant to the photochemical evolution ofMars and potentially linked to provocative possibilities, including activevolcanism among others." Garvinadded that "the real test" will come when the broadest possible participationby the international community gains an opportunity to analyze these new data,given the potentially controversial nature. "That's the way science breakthroughsgain standing in the science community." review by external experts, including those who have made similar detectionsfrom Earth-based systems. Garvinexplained that NASA's Mars Odyssey detected a higher concentration of hydrogen,not necessarily water ice. Mars Odyssey cannot observe "water icelayers", Garvin said, only the presence of hydrogen. Furthermore,that hydrogen, he added, could be due to hydrated minerals, such as those foundon the surface by the Mars Exploration Rovers and also detected from orbit bythe Mars Express OMEGA imaging spectrometer. InGarvin's view, the real test will come when future spectrometers -- such asthose destined to fly aboard the NASA Phoenix lander to be launched in 2007,and potentially carried on the Mars Science Laboratory in 2009 -- corroboratethe Mars Express measurements. "Themessage here is that exciting initial observations such as those reported bythe Mars Express PFS are what catalyze new questions, observations, and ultimatelytestable hypotheses," Garvin concluded.